McDonald’s Corporation is expanding its fast food franchise into the Vietnamese market, according to a press release issued by the company last week. The first McDonald’s restaurant will open next year in Ho Chi Minh City under the management of Developmental Licensee (DL) Henry Nguyen, founder of Good Day Hospitality. “McDonald’s is a well-loved brand around the world, and we are pleased to be opening in Vietnam and bringing the McDonald’s experience of quality food, great service and contemporary design to our 38th country in Asia,” said McDonald’s CEO Don Thompson. Fast food brands have been in popular demand since 1997 when KFC opened its first franchise in Vietnam. Following KFC’s debut in the country, several other international chain restaurants entered the market, including Pizza Hut, Burger King, Starbucks and the Japanese burger purveyor Lotteria. According to a market research report released by the Vietnam Investment Review, nearly 50 percent of Vietnamese enjoy fast food, with 20-30 year-olds accounting for three quarters of the market. The announcement from McDonald’s follows a several-year journey by the company to formulate an entrance strategy and locate local talent to run the franchise. “I’m proud to be part of a great team that is working hard to open up our first restaurant in Ho Chi Minh City. Our local team is preparing and training our first managers and crew for that exciting day,” said DL Henry Nguyen. The first restaurant is expected to create 100 direct jobs in Ho Chi Minh City and will also source a large portion of the restaurant’s ingredients from local suppliers. Following wide success in the United States, McDonald’s Corporation began franchising its restaurants internationally in 1967. 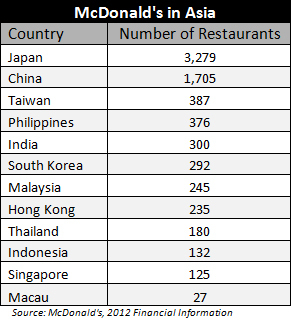 McDonald’s entered the Asian market in 1975 with a restaurant in Hong Kong. Since then, the fast food company has expanded its reach in Asia, serving over three dozen countries in the region and creating special menu items to cater to local tastes, such as the all-chicken Maharaja Mac served in India and a seasonal Chinese New Year Meal.